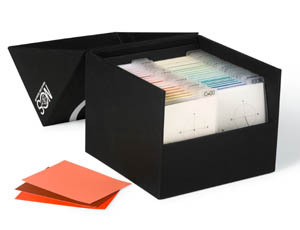 The NCS Box holds one A6 Sheet for each all 1950 NCS Original colours with index cards separating each hue, e.g. R80B. The NCS Box is ideal for studio work where colour judgments need to be made using larger samples which are ready to hand. Colour boards can be made up at short notice, or colour samples sent to clients. The A6 Sheets can be replaced. See NCS Sheet.